Let us remember that God has given to all of us, little children as well as grown-up people, a place in His garden here on earth, and He would have us take these white flowers, the lives of His saints, as a pattern for our own. We may not be set where all can see us; our place in God's garden may be a very humble and sheltered spot; but, like the saints, we may keep our faces ever turned upward, and learn to grow, as they grew, like their Master, pure and straight and strong—fit flowers to blossom in the Garden of God. 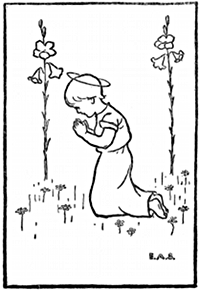 - Words and illustration from "In God's Garden: Stories of the Saints for Little Children."